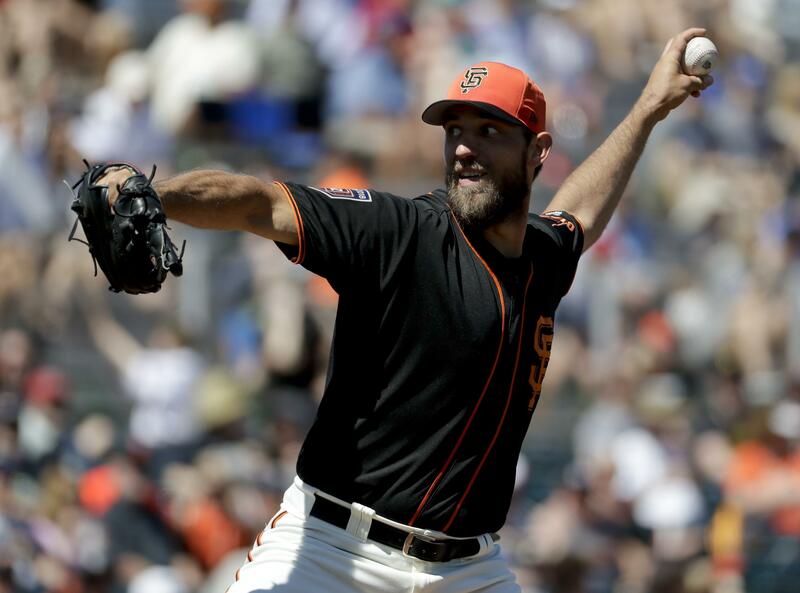 SAN FRANCISCO – San Francisco Giants ace Madison Bumgarner threw off a mound Monday for the first time since surgery in March to have three pins inserted into the broken pinkie on his pitching hand. Bumgarner threw 20 fastballs to take another step in his comeback from the injury that sidelined him since being hit in the hand by a line drive at the end of spring training. He said he’s been throwing breaking pitches on flat ground but because the session was so short Monday he stuck to fastballs and was encouraged by how he felt. Bumgarner will throw another bullpen session Wednesday and could be ready to face hitters next week when the team is in Houston. If all that goes well, Bumgarner would be ready to go out on a rehab assignment in the minors but probably won’t be ready to return to the majors until the beginning of June. Manager Bruce Bochy said the number of rehab starts will depend on whether they fully stretch him out in the minors or let him do that in the majors. Bumgarner said he’s open to either path as long as his offspeed pitches are sharp in the minors. The Giants aren’t concerned about his arm strength because the injury was to a finger, not a shoulder or elbow. “That’s why he’s letting it go the way he is now,” Bochy said. “If you watched the bullpen today you’d think he’s making his next start. It’s where he’s at. The issue right now, he’s got to build some stamina and strength because he hasn’t been throwing that much. This is the second straight season Bumgarner has been sidelined by a significant injury. The 2014 World Series MVP missed nearly three months last season with a shoulder injury after a dirt bike accident on April 20 during a day off in Colorado. Closer Mark Melancon also threw a bullpen session Monday as he works his way back from an elbow injury that has sidelined him all season. Melancon threw 25 pitches and could be ready to throw to hitters on Thursday. Published: May 14, 2018, 7:14 p.m.